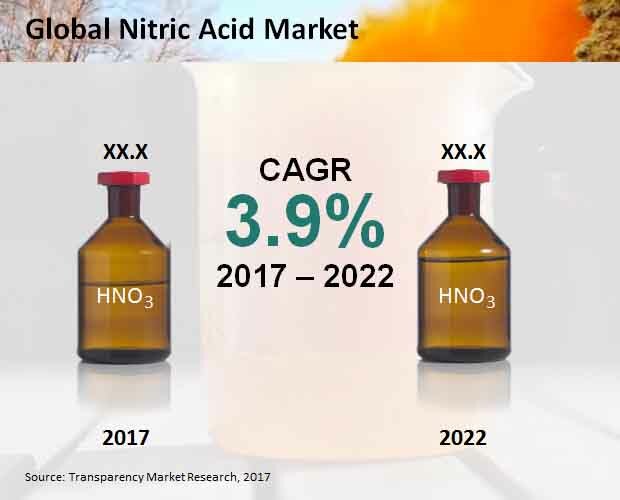 The global nitric acid market report provides in-depth insights into the size and share of various segments, remarkable trends and opportunities in various regions, and the competitive landscape, including key strategies adopted by various players to consolidate their shares. The study meticulously tracks the changes in regulatory landscape and advances in technologies pertaining to the commercial production of nitric acid. In addition, the report takes a critical look at the key factors driving the prominent segments. Offering a critical assessment of key factors affecting the market sizing of various segments over the historical period (2012–2017), the research offers evidence-based projectoions of the market along the forecast period (2017–2022). It highlights notable advancements in end-use industries and evaluates their impact on the demand for nitric acid in major regions. It analyzes the supply chain dynamics and raw materials sourcing strategy to offer a holistic overview of the market and emerging avenues likely to prove lucrative in the coming years.